Display a list of agents on one page using a shortocde. 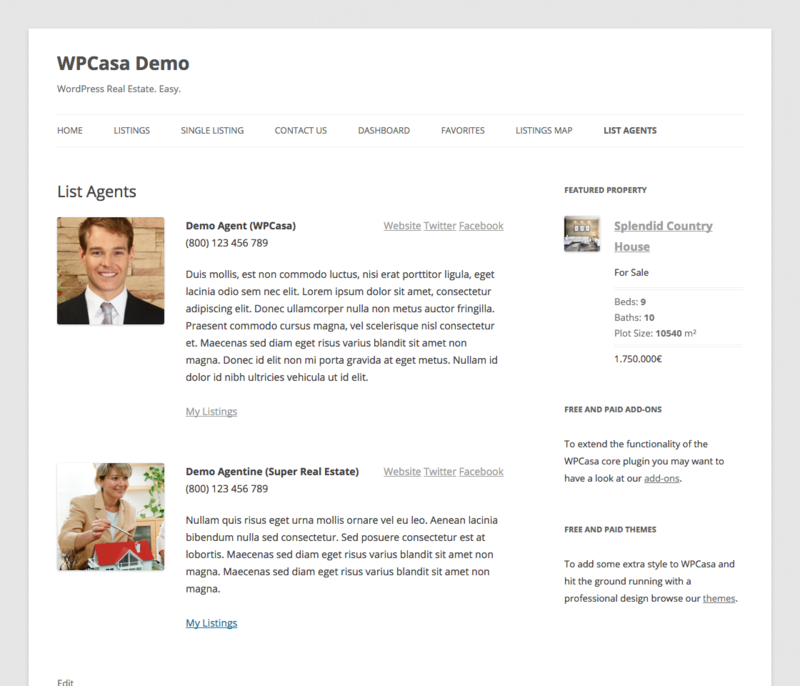 The WPCasa List Agents add-on is an easy way to display all the agents you want to be included on one single page. The agents are displayed with an information card including links to their listings and social profiles. 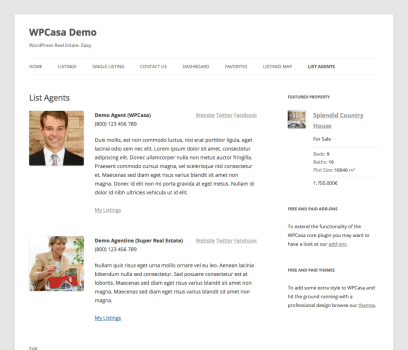 Automatic installation is the easiest way to install WPCasa List Agents. 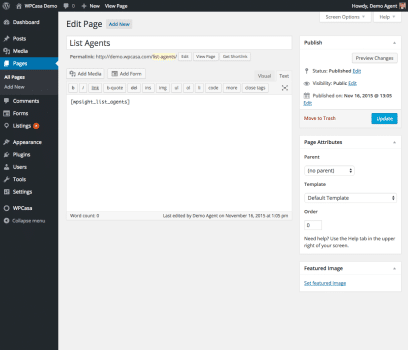 Log into your WordPress admin and go to WP-Admin > Plugins > Add New. Then type “WPCasa List Agents” in the search field and click Install Now once you’ve found the plugin. This add-on is brand-new and has not been approved in the WordPress plugin repository yet. Please download and install manually until then. If you prefer to install the plugin manually, you need to download it to your local computer and upload the plugin folder on WP-Admin > Plugins > Add New > Upload Plugin. Then activate the plugin. When this add-on is activated a new shortcode [wpsight_list_agents] will be available that you can add to a static page to display a list of agents on your website. For more detailed information please also read our documentation. Heads up! 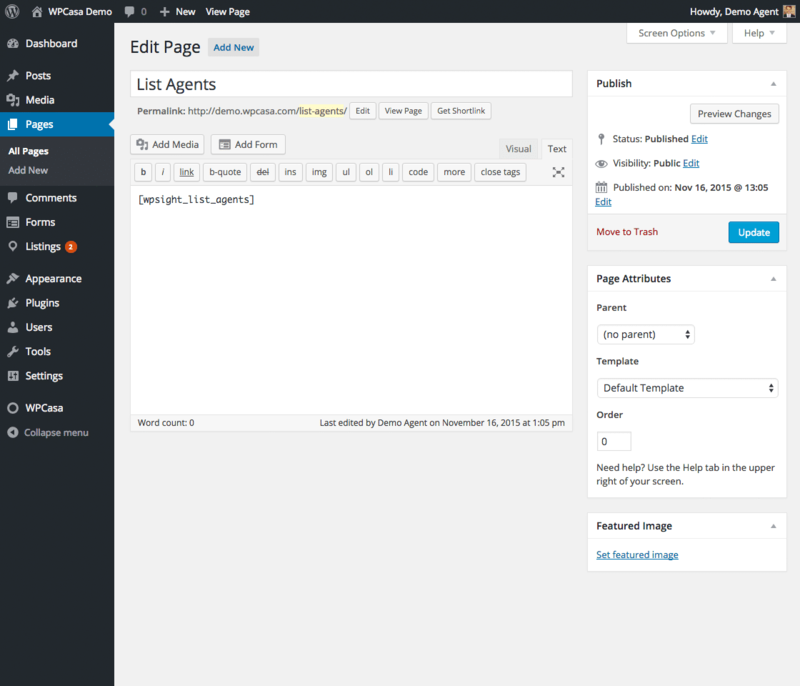 This is an add-on plugin and will only work in combination with the WPCasa core plugin. Here are some details that might interest you before you use this add-on. Do I need WPCasa to use this add-on? Yes, this add-on plugin only works in combination with WPCasa. When you activate it in a WordPress installation without the WPCasa plugin installed, it will do nothing. Does this free add-on include premium support? No, for premium support you need to purchase one of our paid products or the support package. You can also visit our knowledge base or post your questions in the community forums. Where do I get updates for this add-on? The updates of our free add-ons are delivered through the WordPress plugin repository. You will get a notice on WP-Admin > Dashboard > Updates once a new version is available. Can I contribute to the development of this add-on? Yes please! We are always looking to improve our code. Whether you have found a bug or would like to contribute in another way, please head over to the Github project. If you have more questions before using this add-on, please do not hesitate to contact us.